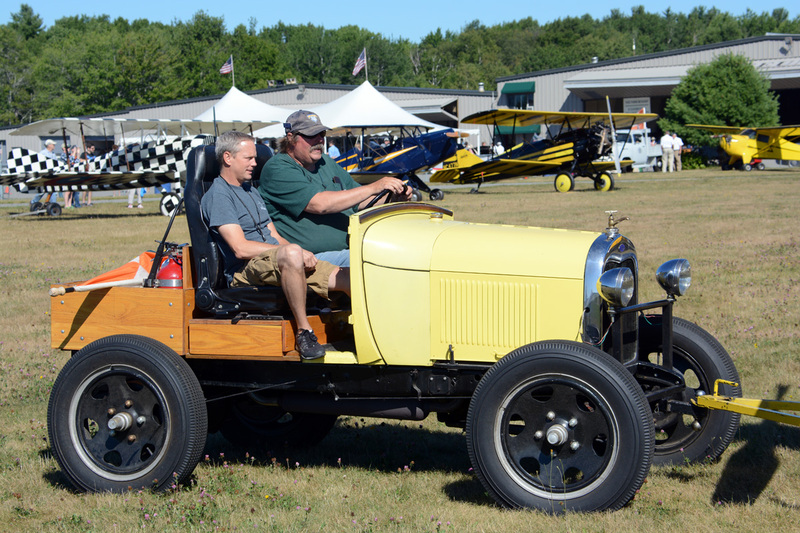 In early August, the annual Wings and Wheels Spectacular drew scores of antique and classic automobiles from the area, and presented a spirited flying display during a surprisingly crisp mid-summer weekend. 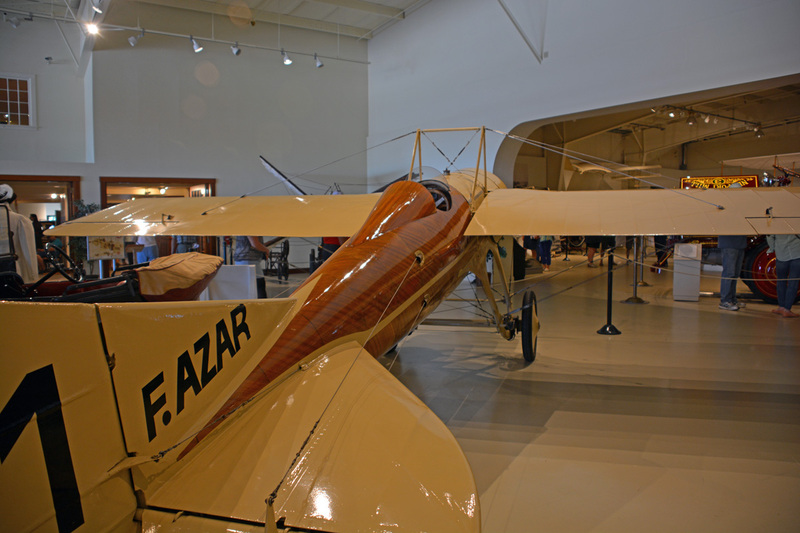 The Museum has 28 different aircraft; the youngest design dates from 1946, the oldest design predates powered flight by a century (including gliders, and unsuccessful powered craft). 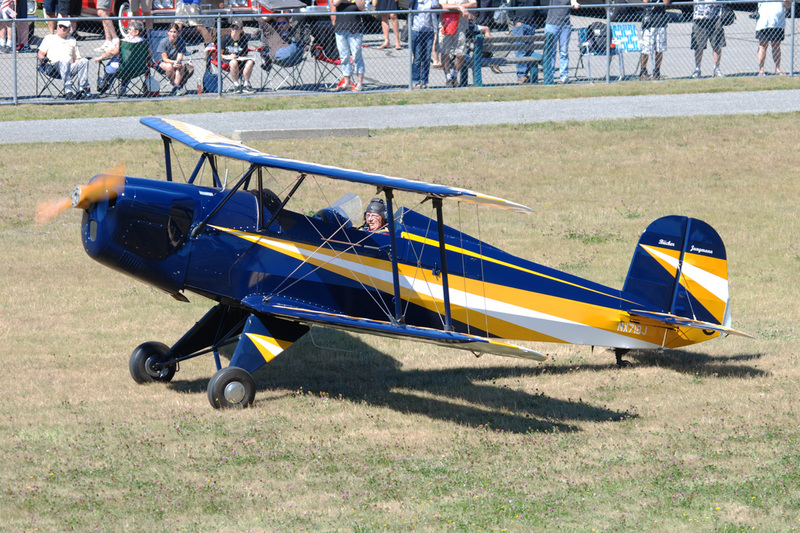 Many of the earliest powered aircraft are replicas, and are kept in an airworthy state. 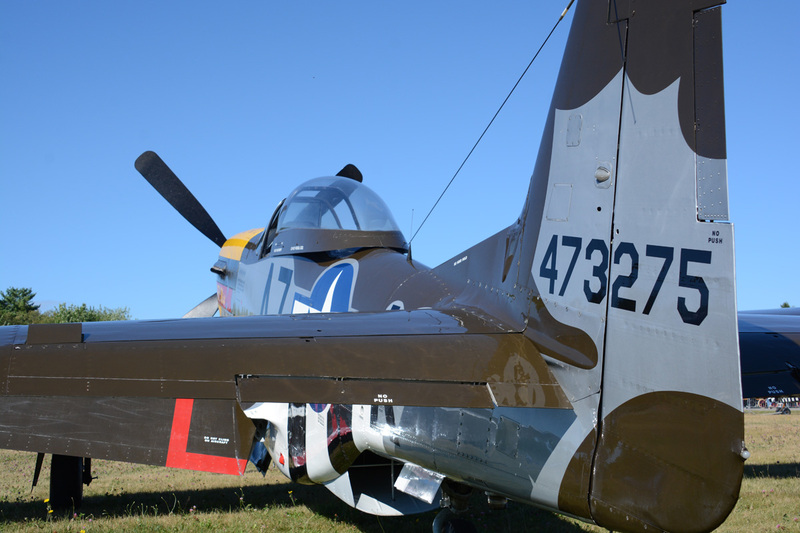 The Museum presented a flying display with a mix of its own aircraft and a group of additional performers brought in to round out an exciting afternoon of aviation. 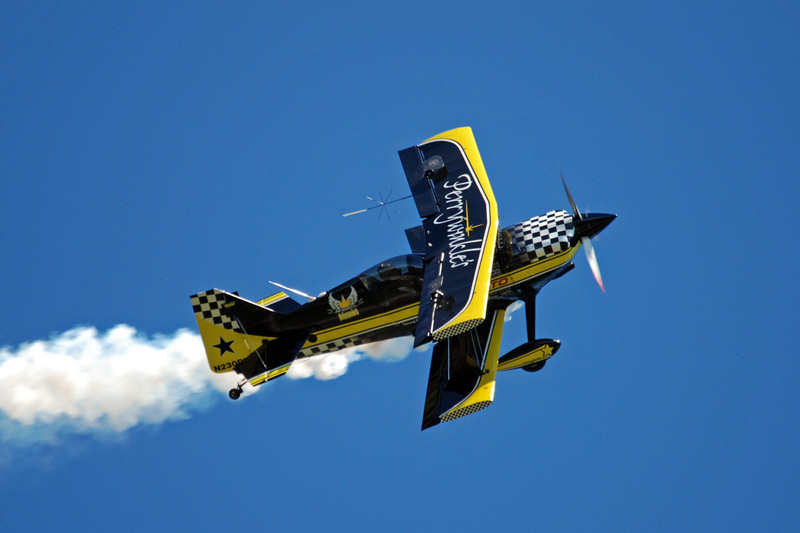 The first day of the weekend’s show was blessed with spectacularly clear weather, and here are some of the highlights. 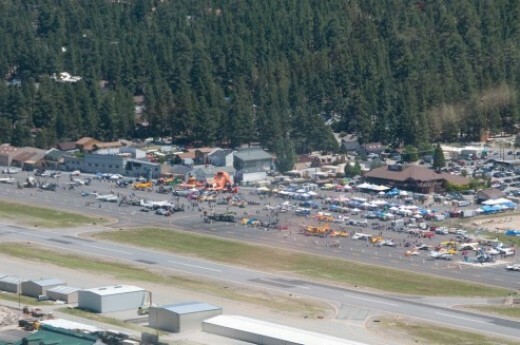 The “Rally”, as it is also known, kicked off its official flying program just after noon… well, sort of. 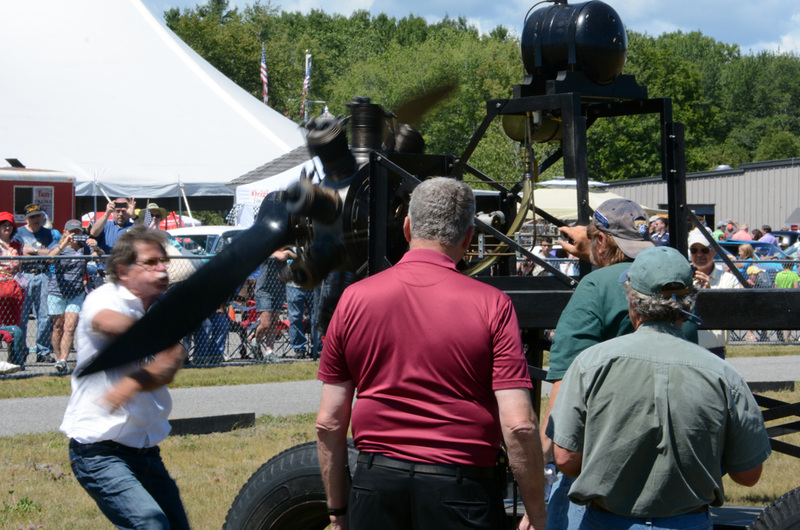 After the playing of our National Anthem, the museum’s working 1917 Gnome rotary engine got swung into life. 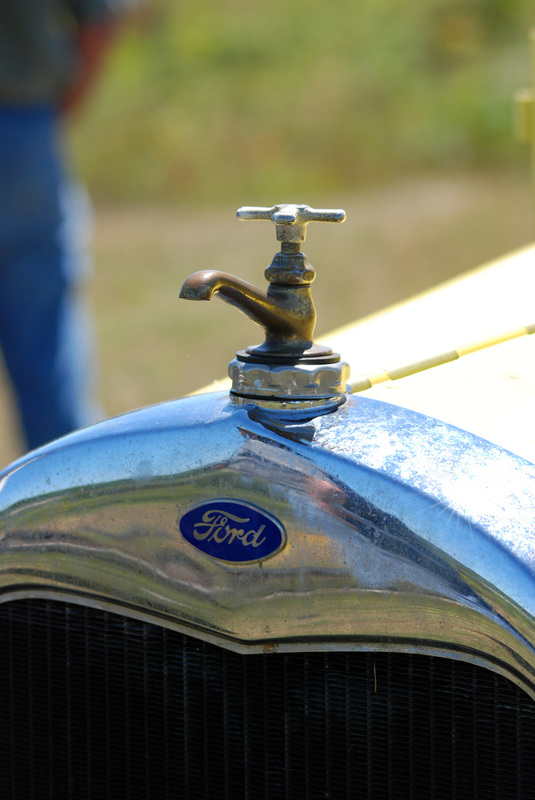 After some effort (volunteers noted that this engine can be temperamental at start), the motor suddenly crackled loudly into life, accompanied with the usual spray of castor oil. 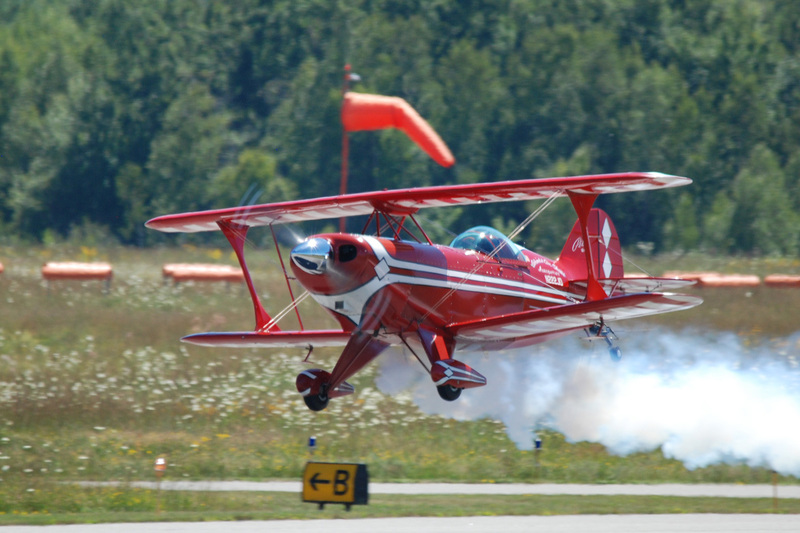 A trio of civilian aerobatic performers then took to the skies… Dan Marcotte in his Ultimate 10-200 biplane, and Jim Parker Airshows, which added aerobatics in a red and white Pitts S-2B and a Salto sailplane. 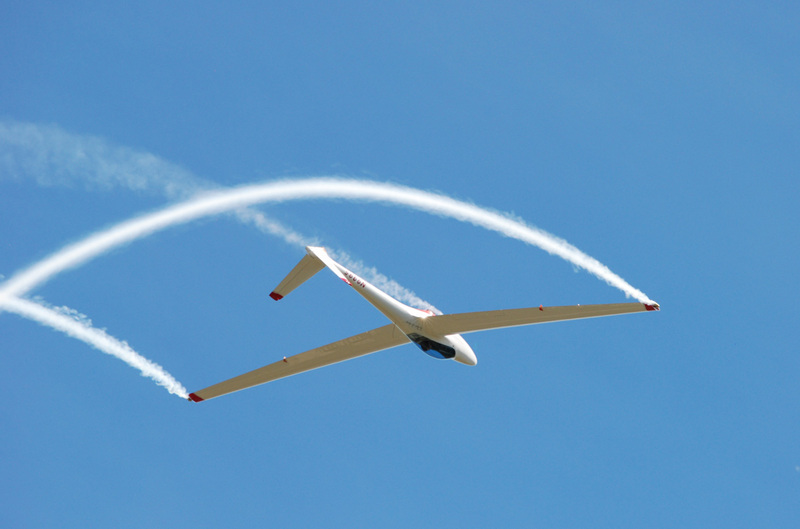 There were radio controlled aircraft too, wheeling around in the bright blue sky, including a jet that could reach 250 miles per hour. 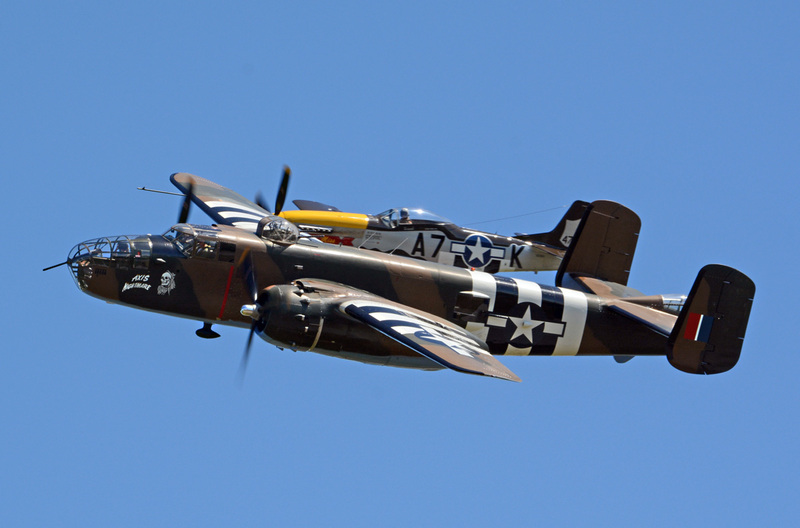 A pair of familiar North American Aviation produced warbirds operated from the adjacent runway… Mark Murphy flew the P-51D Mustang Never Miss, and the Tri-State Warbird Museum, of Cincinnati Ohio, brought their B-25 J Axis Nightmare to the Museum. 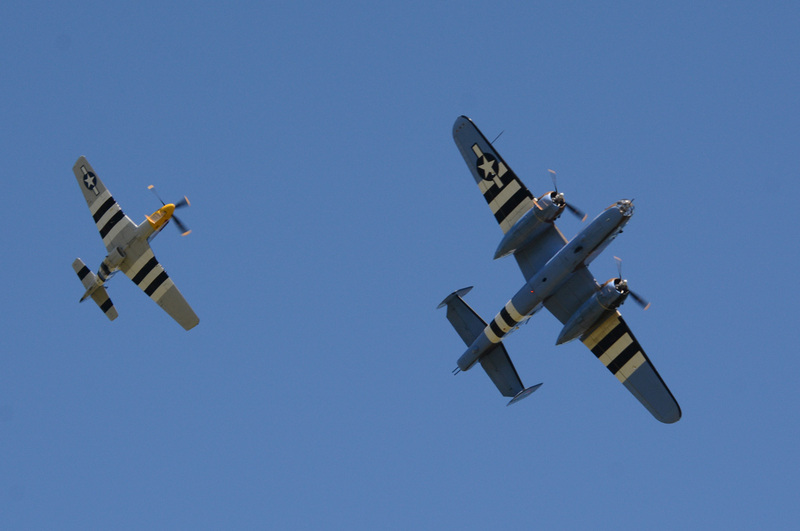 During the show, the planes flew a series of graceful passes in formation, and then split up for individual presentations. 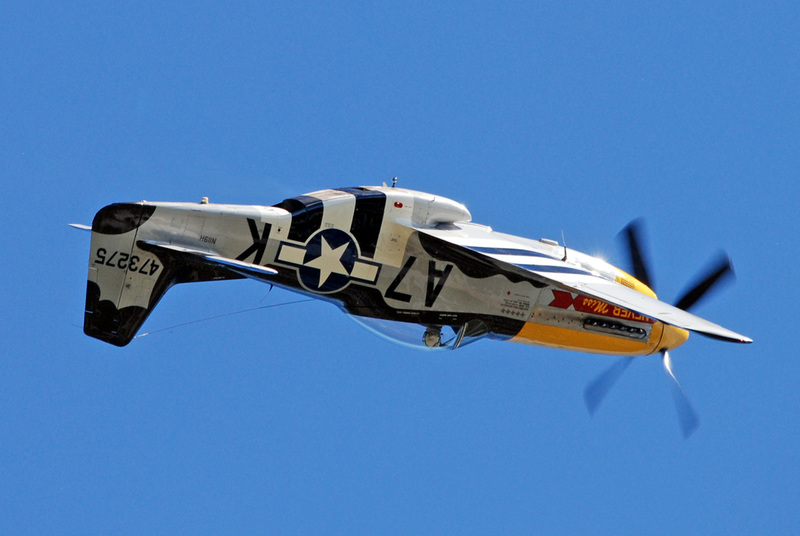 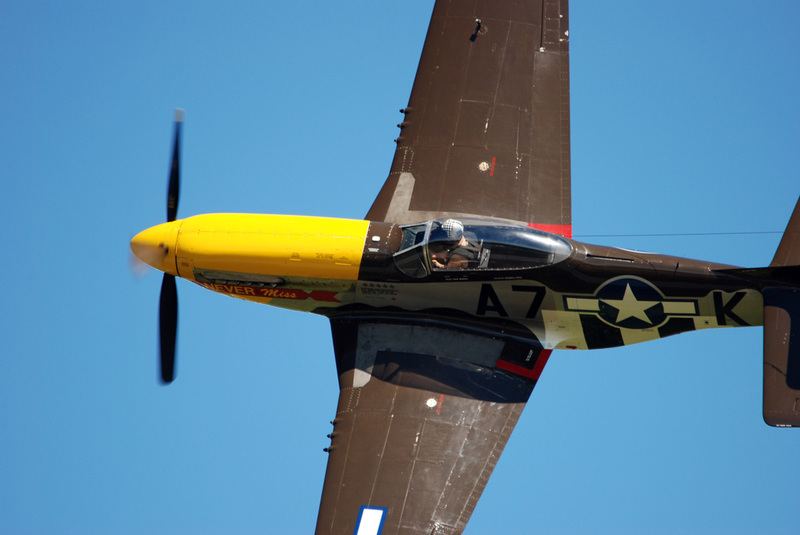 Mark Murphy flew his full Mustang aerobatic routine, in which he showed off the classic lines of one of North American Aviation’s most famous warplanes. 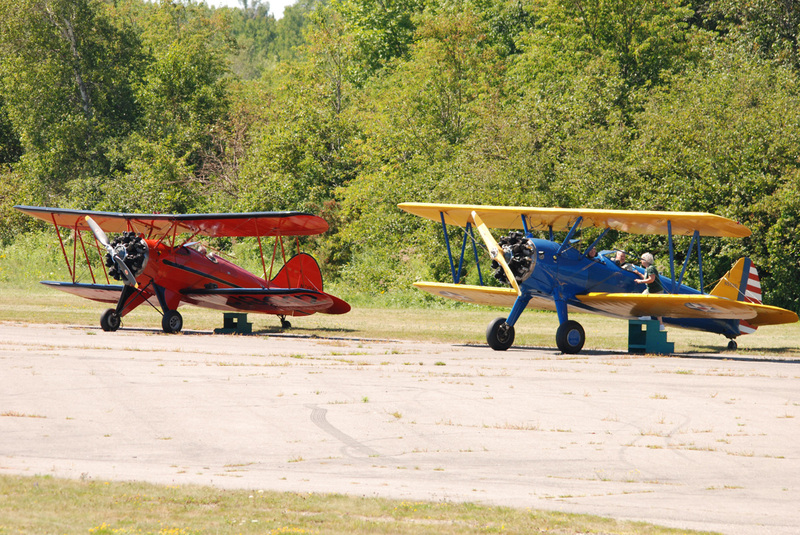 The noise of the Rolls Royce Merlin and the pair of Wright R-2600 Cyclone engines reverberated from trees and hangars on an otherwise quiet afternoon. 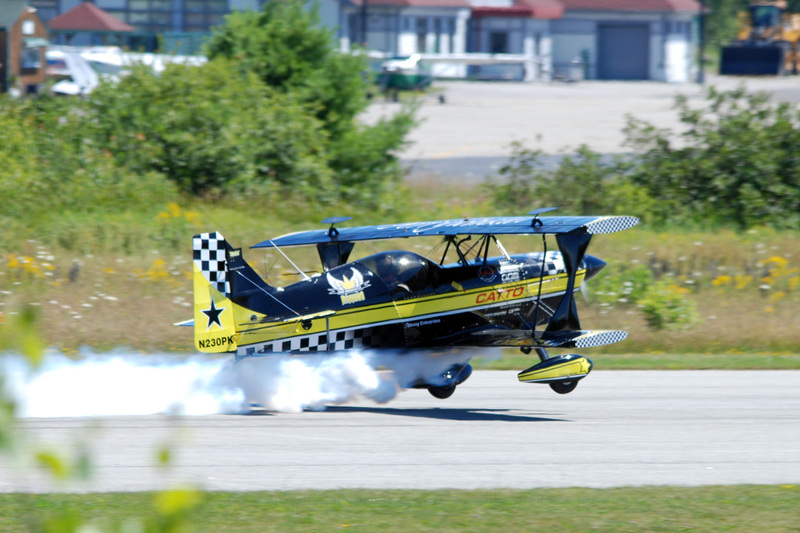 Before and after the aerobatic performances, the airport hummed with activity. 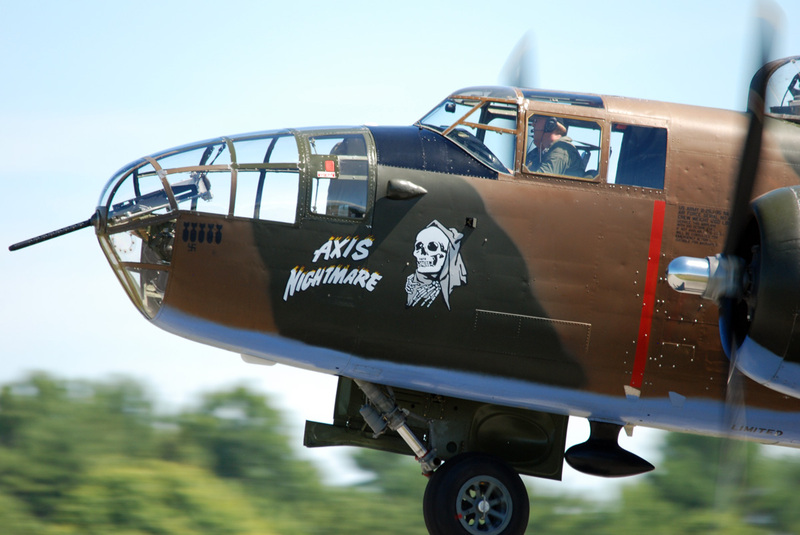 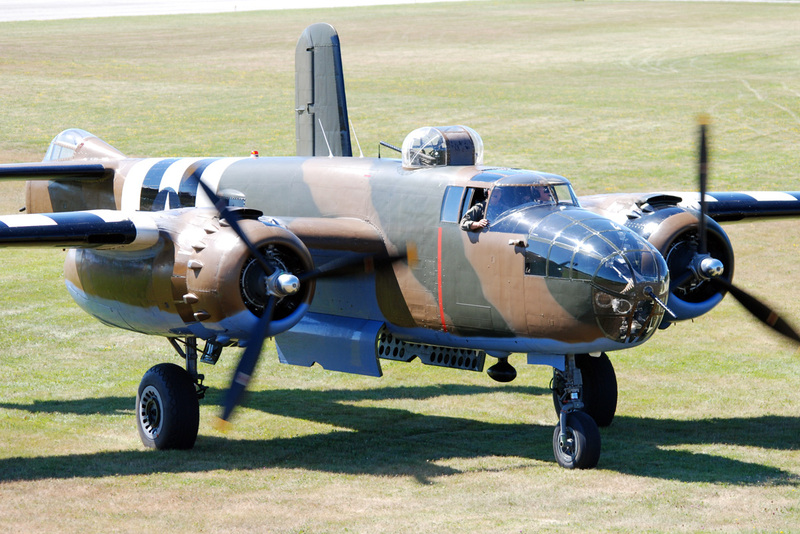 Besides normal activity from general aviation and commercial operators using the field, the warbirds were airborne with passengers, including one family whose father was once a B-25 instructor pilot. 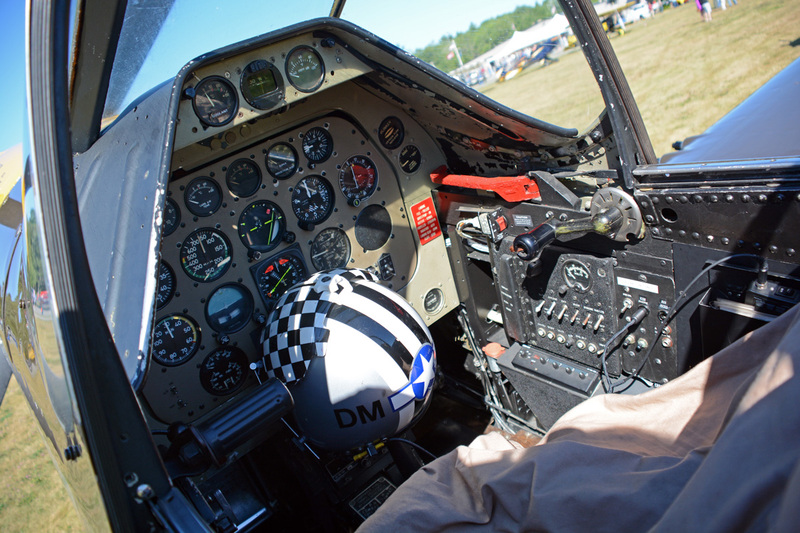 The aviator had passed on, but his leather flying helmet was brought aboard to take to the sky again. 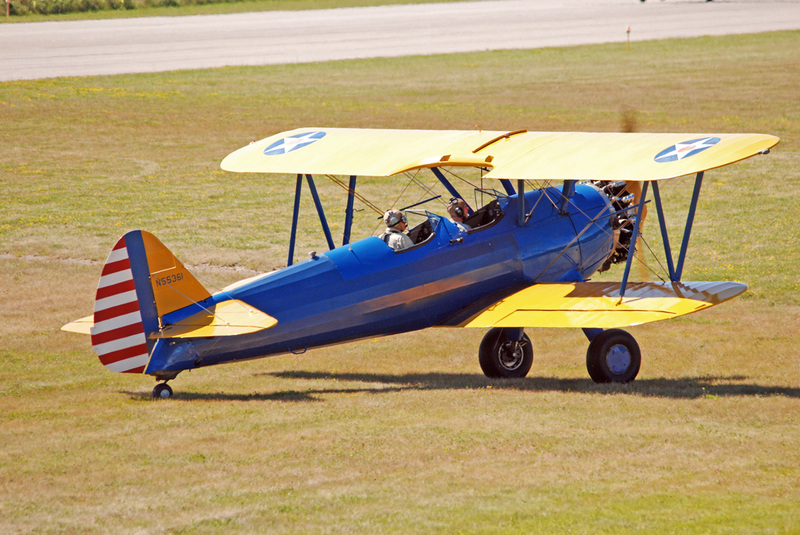 The Museum operated a pair of open cockpit biplanes – a PT-17 Stearman and a Waco UBF – for paying passengers to feel the breathtaking sensation of the wind in their faces. 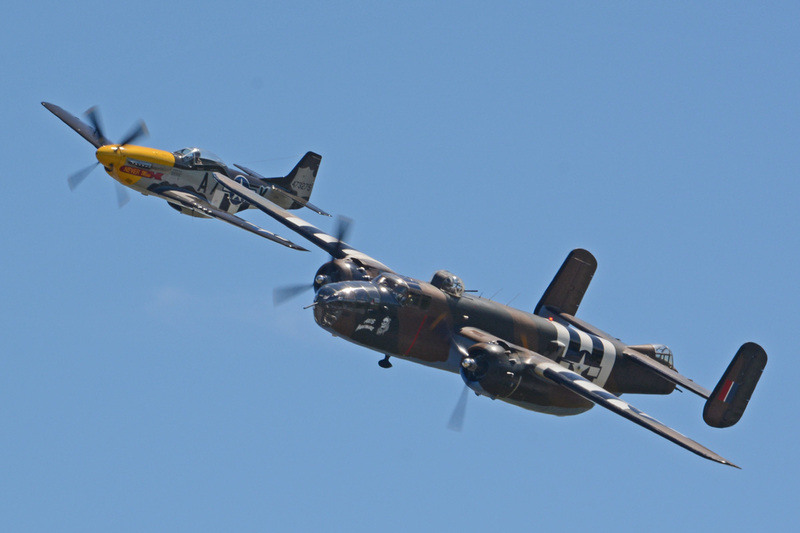 Later in the morning, three classic aircraft not normally seen at air shows flew a series of low passes in front of the crowd. 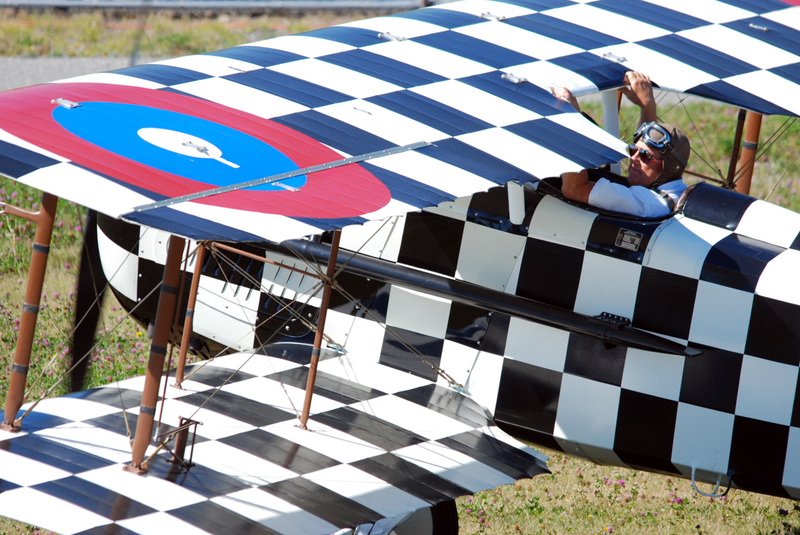 The Museum’s replica SPAD XIIIc.i is painted in an eye-popping black and white checkerboard pattern, with red and blue roundels and the famous “Hat-in-the-Ring” 94th Aero Squadron insignia emblazoned on the fuselage. 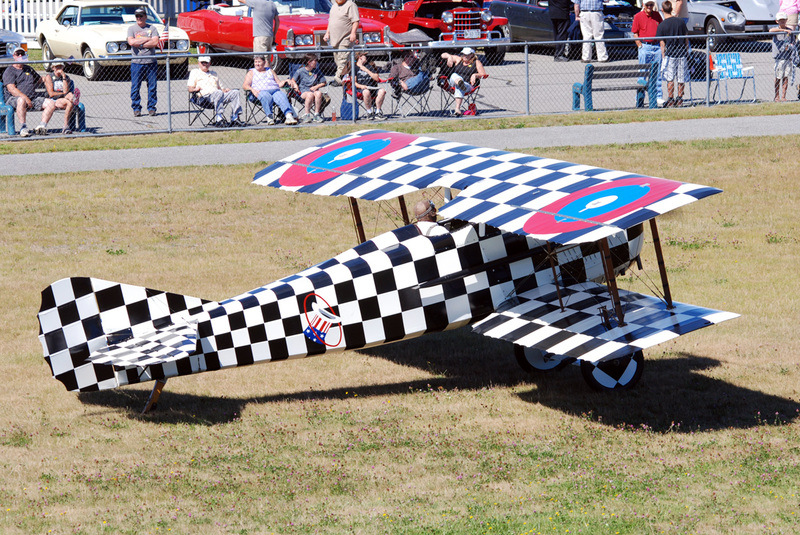 The Museum applied this color scheme after a restoration a few years ago, backed up with photographic proof that Captain Eddie Rickenbacker had his personal aircraft painted in this scheme when he commanded the squadron shortly after World War I ended. 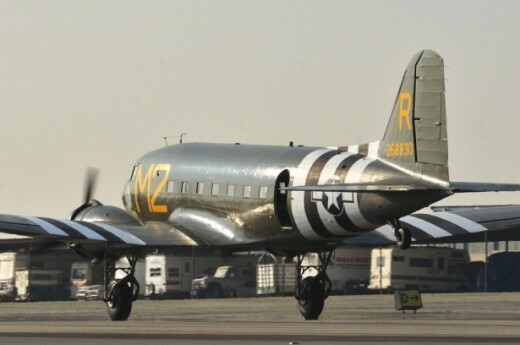 Everything on the aircraft is hand painted too; it reportedly took quite a number of rolls of masking tape to allow for the stunning pattern. 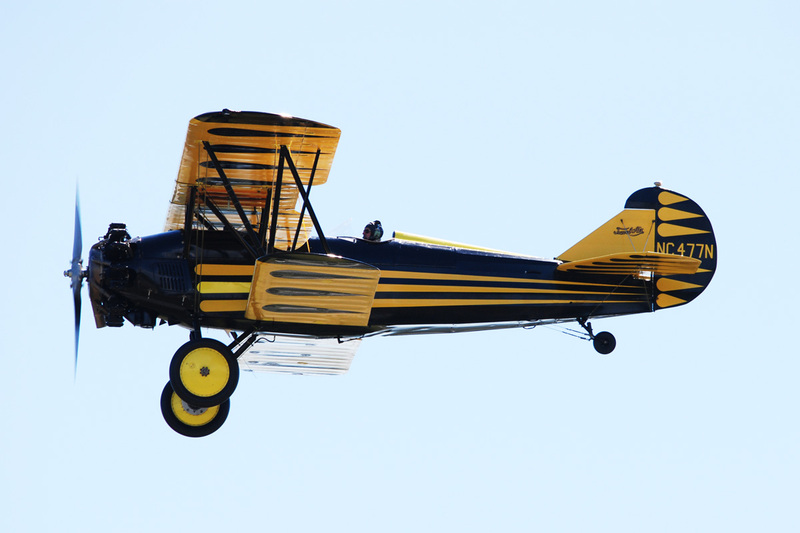 Next up was a Bucker Jungmann, the second to the last one ever built. 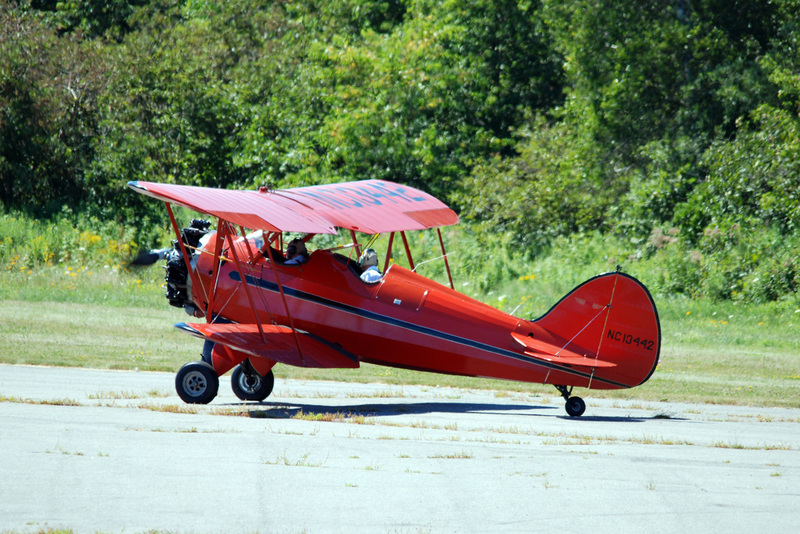 Finally, a 1930 vintage Travel Air D4000 took to the skies, to show what general aviation aircraft looked and sounded like back then. 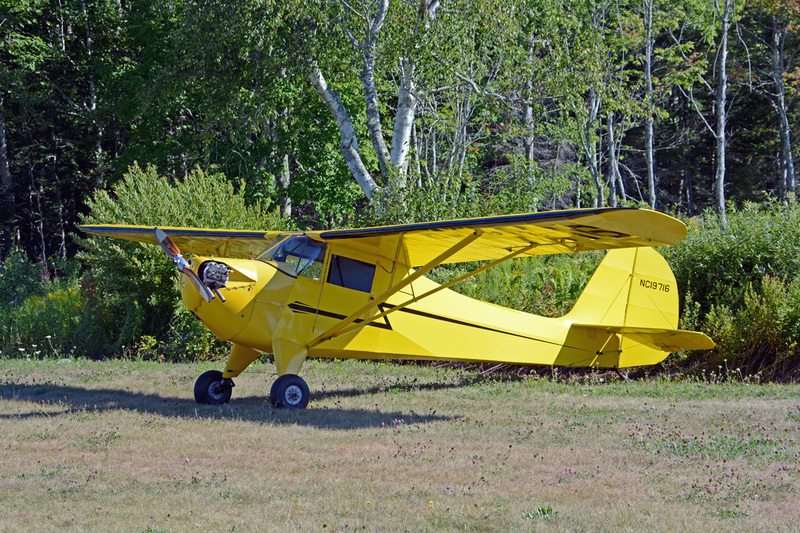 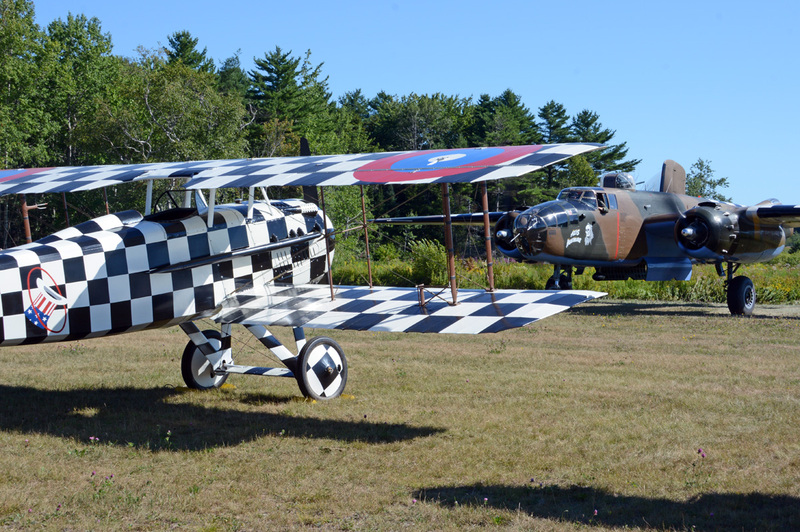 Most of the more “modern” aircraft at the Owls Head Transportation Museum are flyable, but this year some of their World War I replicas and a few older civilian models were undergoing repair and restoration, so they stayed on the ground. 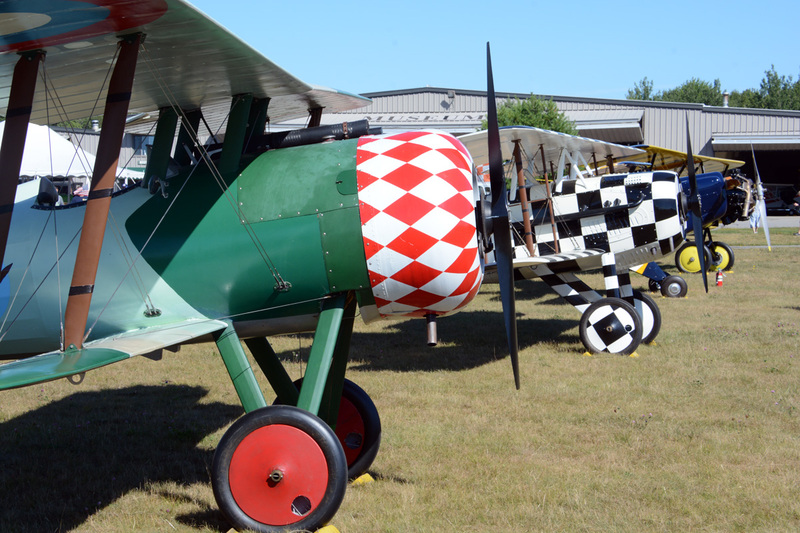 This included their 1917 replica Nieuport 28C.1, which sat next to the SPAD XIII on the grass parking area. 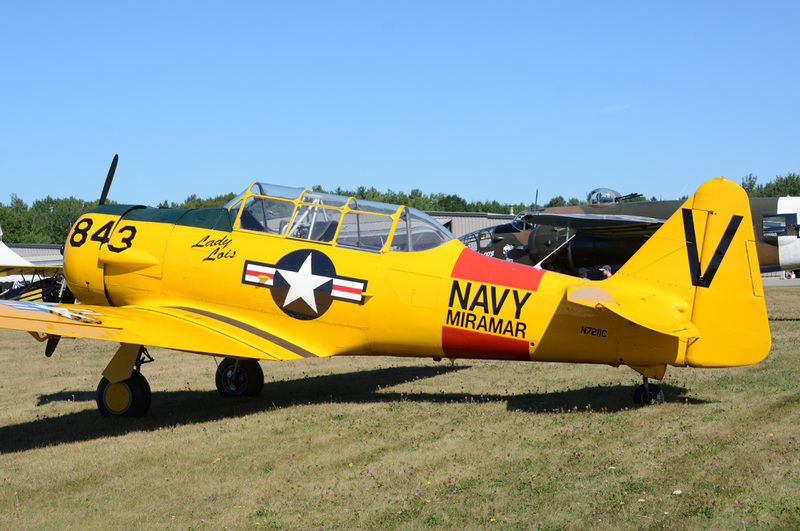 Visiting aircraft that remained on the ground Saturday included an AT-6D Texan and a Aeronca KC. 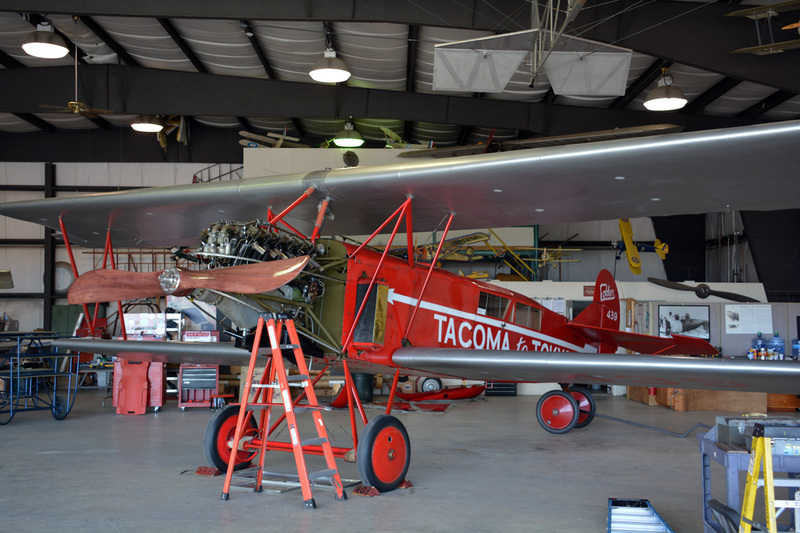 Within one of the larger hangars of the Museum, other aircraft like the Fokker C.IVA were on display as restoration and maintenance work continued on them. 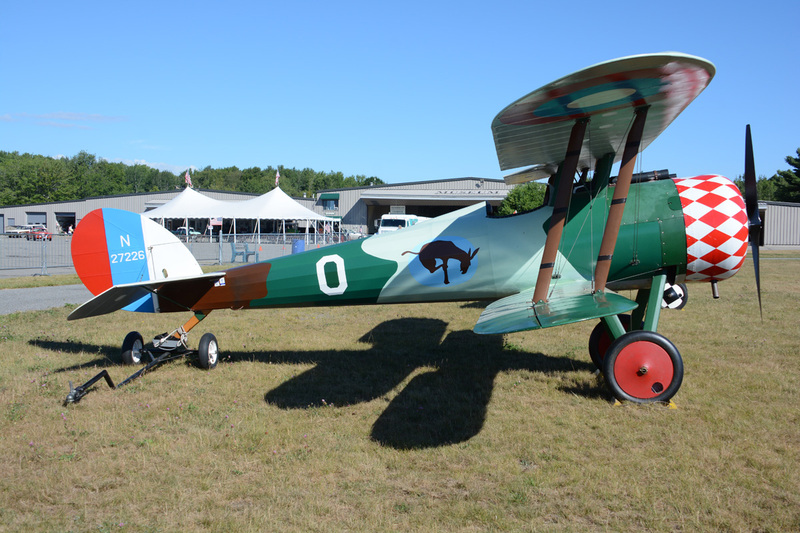 This Fokker, when maintenance is finished, will continue to be the only airworthy original in the world. 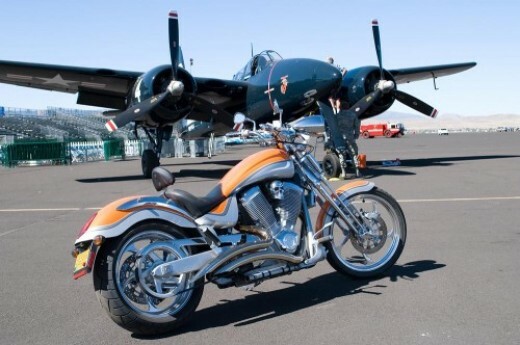 The main buildings of the Museum house the planes, cars, motorcycles and other memorabilia, and these hangar doors were opened so spectators could stroll in from the outdoor aircraft and auto display areas easily. 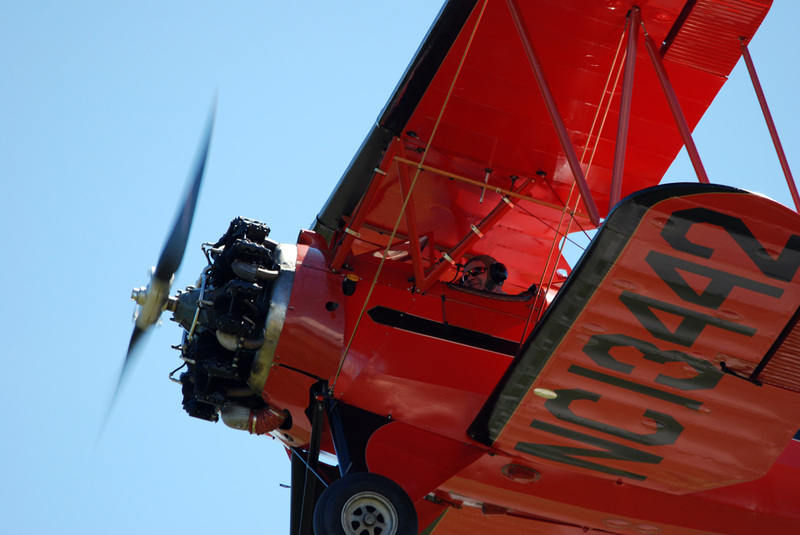 This natural light gave the buildings a very open and airy feel. 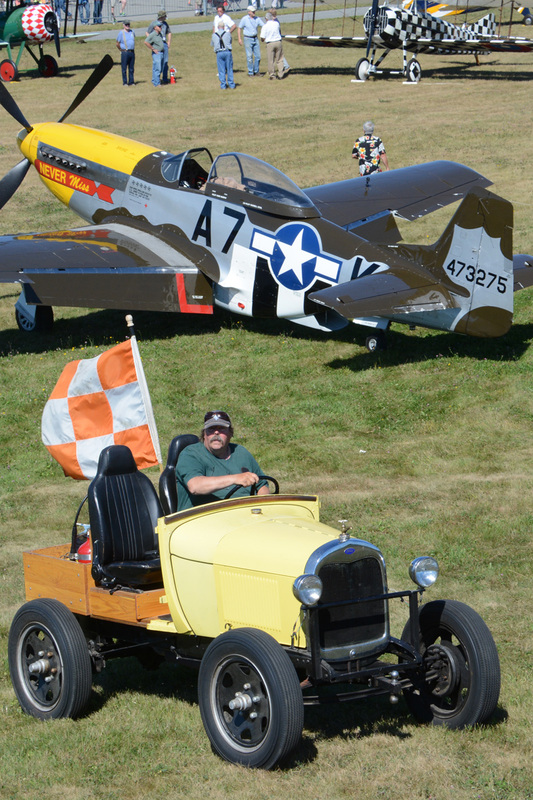 As spectators strolled among the Fords, Chevrolets, Dodges and MGs (to name just a few), aircraft were repositioned on the grass in front of the spectator viewing area. 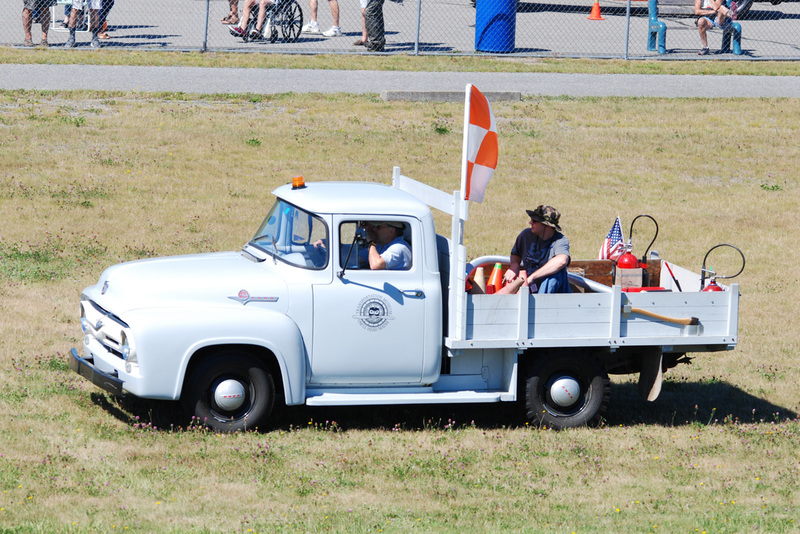 Some moved under their own power, others were towed using the Museum’s antique and unique Ford tug, driven by Everett Perkins. 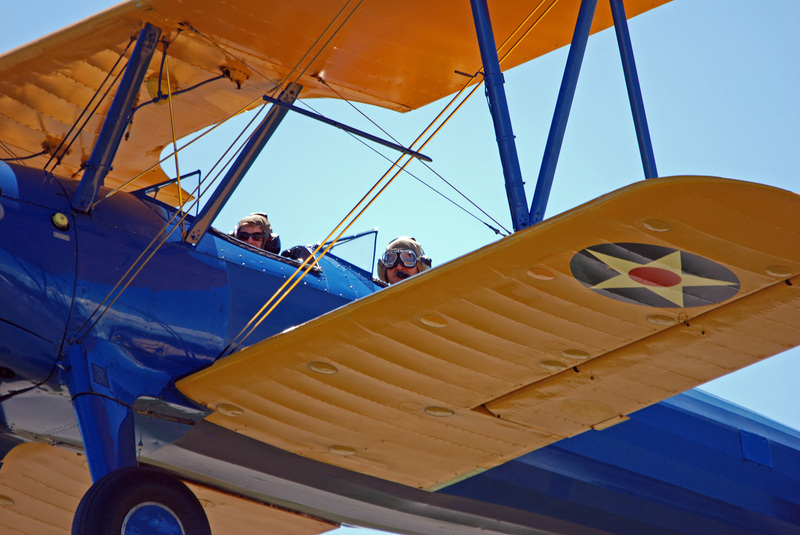 Special thanks go to the Museum’s Public Relations Director Jenna Lookner for arranging my excellent access during the show, and to Mark Murphy for letting me look at his “office” – the cockpit – in Never Miss.